We have added the Lake Oswego “Neighborhood Planning Kit” and “Neighborhood Planning Options” to our Documents page. For more information about Lake Oswego Planning, their history, projects, and resources, visit https://www.ci.oswego.or.us/planning/neighborhood-planning-materials. 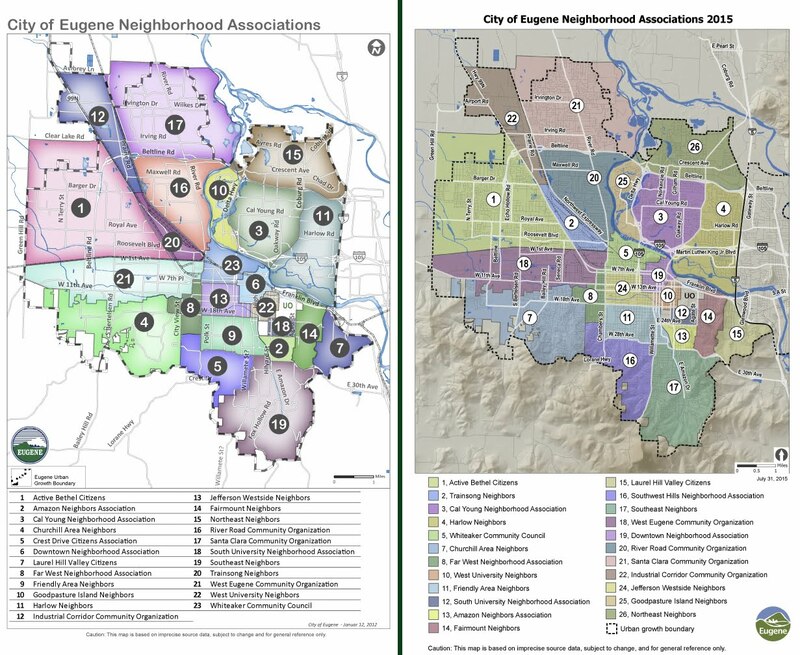 We encourage you to examine this exemplary tool that could help inform Eugene’s Neighborhood Associations in their efforts to work on and produce successful refinement plans for their areas. April 26, 2017 - South Willamette Street Initiative update: Today the Eugene City Council voted on a motion brought forward by Councilor Greg Evans last week during the Council's Work Session on South Willamette. The motion was revised at that meeting but voting was tabled until the City Council meeting on Monday, April 24. At that meeting, the vote was postponed once again until today's Work Session. I move to direct the City Manager to continue community engagement in South Eugene and to report back to Council after the community engagement task is complete including next possible steps. developing and bringing back to Council plan for moving forward on University neighborhoods. If neighborhoods other than those mentioned above bring neighborhood planning ideas to the City Manager, the City Manager shall forward those ideas to the Council for consideration. MOTION AND VOTE: Councilor Brown, seconded by Councilor Clark, moved that the City Manager is directed to prepare, in consultation with the appropriate City staff and the elected boards of the four City-chartered south Eugene neighbors – Friendly Area Neighbors (FAN), Southwest Hills Neighborhood Association (SHINA), Southeast Neighbors (SEN) and Amazon Neighborhood Association (Amazon) – a proposal for a planning process that is based on the South Willamette Street Initiative (read full text here). The City Manager’s proposal shall embody the basic structure and elements of the South Willamette Initiative; however, the proposal may make limited adjustments to the geographic boundaries, the composition of the planning team and other details. The proposal may also include recommendations for additional guidelines for the refinement plan process to be established by City Council. A check-in with Council on the status and progress of the draft proposal no later than November 7, 2016. A final draft proposal shall be presented for Council and public review no later than December 1, 2016. Council’s initial discussion and further direction to the City Manager on the proposal shall be scheduled for the December 14, 2016, Council work session. Council’s deliberation and action on the proposal shall be scheduled as soon as practicable following swearing in of the new Council in 2017. PASSED 7:1, Councilor Syrett opposed. "The Eugene City Council killed the proposed rezone of the south Willamette area Monday night." "The council voted unanimously, after little discussion, to withdraw the so-called South Willamette Special Area Zone from further consideration, ending a five-year planning effort that had stalled in November amid a public outcry from neighbors . . . "
A new "South Willamette Initiative" was sent to Mayor Kitty Piercy, the City Councilors, and the City Manager on April 25, 2016, by Eugene City Councilors George Brown and Mike Clark. The initiative proposes a new direction for improvements to properties located in south Eugene to replace the SW-SAZ plan. Your voice and support of this new proposal are needed. Send your e-mail to Mayor, City Manager, and City Council or by post to 125 East 8th Avenue, 2nd Floor, Eugene OR 97401, as soon as possible. Please be sure to add that your letter should be entered into the public record regarding SW-SAZ. April 20, 2016: YARD SIGNS -- AGAIN!! Once again, somebody has reported SWN yard signs as being unlawfully placed in the public Right-of-Way or that there are too many signs posted on the development site. Similar complaints were made about SWN signs in early March, about which a letter to the Editor of the Register-Guard was published and KEZI ran a news story. The City of Eugene has specific regulations governing how and where signs expressing free speech messages can be placed. If the City receives a complaint about placement that allegedly violates the code, it will respond by sending an employee out to investigate. Two visits are often required: one to issue a complaint notice, usually by way of a door hanger (if the resident is not available) and the second to remove the sign if the placement has not been corrected. Know the rules covering where to place a sign. Know also whom to contact with questions or how to report a sign that has been removed by somebody without sufficient notice. For information about sign placement or for help interpreting or complying with the City's code, contact Doñna Nowakowski - (541) 682-6031, Compliance Services Inspector, City of Eugene, Planning & Development. If after June 30, 2016, please contact Phillip Hubbard (541) 682-6646. EC 9.6610 (2), Exemptions to Sign Standards. Residential Property Signs. Two signs for each development site used primarily for a single family dwelling or duplex. The signs are limited to the following types: freestanding or banner. A freestanding sign may not exceed 12 square feet in size per face, with a maximum of two faces; a banner may not exceed 15 square feet in size. The maximum height of a freestanding sign under this exemption is 6 feet (from grade), and it must be separated by at least 8 feet from any other freestanding sign on the same development site. April 6, 2016: Oregon Consensus issued its Assessment Report, prepared by Turner Odell and Tim Hicks on March 21, 2016. January 24, 2016: A vacancy on the City of Eugene's Planning Commission was recently announced. South Willamette neighbors should apply! The City of Eugene is seeking motivated volunteers to serve on the Eugene Planning Commission. All application materials are due by March 31, 2016. For more information, contact Alissa Hansen by e-mail or at 541-682-5508. January 20, 2016: An architectural model showing the impact of a commercial/mixed use development allowed under the proposed rezoning of the South Willamette Special Area Zone on single-family residences was presented by Paul Conte during his recent talk, "Trust the Neighbors: An Introduction to Community-Based Planning." See more of Conte's studies and analyses at his blogspot http://trusttheneighbors.org/sw-saz-zone-change/. The model was created by Yue Fan based on specifications within the SW-SAZ proposed code. 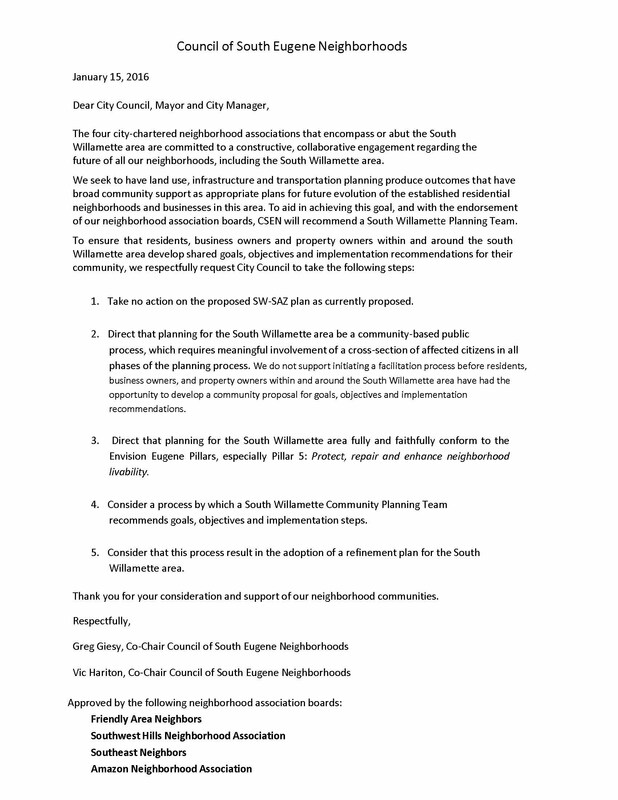 January 18, 2016: A letter sent to the Eugene City Council on January 15, asking for a citizen-driven planning process for the South Willamette area, drafted by the Council of South Eugene Neighborhoods (CSEN), was approved by all four South Eugene neighborhood association boards: Friendly Area Neighbors, Southeast Neighbors, Southwest Hills Neighborhood Association, and Amazon Neighbors. This is an important victory. It shows to the city four impacted neighborhood associations speaking with one voice on the SW-SAZ issue. The four neighborhoods have also approved a charter through which they can work together on SW-SAZ, which impacts all of south Eugene. The Council of South Eugene Neighborhood's charter is also envisioned to be able to establish work teams to address future issues as they arise, issues which like SW-SAZ are of multi-neighborhood concern. January 14, 2016: In the City of Eugene's organizational chart, the Citizens of Eugene occupy the top rank, above the Mayor and the City Council. The City Manager is positioned in the third tier. January 9, 2016: We have prepared a table that lists the proposed changes in both the Eugene Metro Plan and SW-SAZ by property address. The Metro Plan would be changed with the approval of SW-SAZ. The table listing shows the current zoning and the proposed zoning. The table is sorted alphabetically by word (street name or directional) and then by number. "Rezoning South Willamette is strongly opposed. However, the High "don't know" percentage indicates that most of the city is not paying attention to this issue. The result also points to the difference between a long-term process like Envision Eugene and the ability to convince the city's population that a certain policy is correct. IF DON'T KNOW: Which way do you lean? METHODOLOGY: 200 telephone interviews of City of Eugene likely general election voters were conducted the nights of December 1-2, 2015. The margin of error at the median is 7% Figures may not add up to 100% due to rounding." 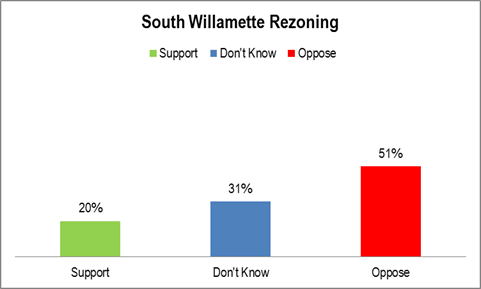 Following the Eugene City Council motions of October 21 and November 9, 2015, that have delayed a decision on the SW-SAZ, the South Willamette Neighbors membership engaged in a number of lively and detailed discussions about what they would like to see happen next in the neighborhood. They arrived at a list of positions, each one approved by vote of the membership on December 1, 2015. Take all residential properties and the 4J property (former Willard School) off the plan until a refinement plan is in place. Put a refinement plan in place. Put transportation and other infrastructure improvements in place, as well as wait for the outcome of the Willamette traffic experiment, before considering changing zoning or plan designation for residential properties. Remove the MMA (Multimodal Mixed-Use Area)* designation from the plan. An understanding that increased automobile congestion within and around the MMA is accepted as a potential trade-off. The flexibility gained by the MMA designation comes from the lifting of a requirement in the Transportation Planning Rules (TPR) to apply automobile congestion standards to the review of certain land use changes. Specifically, a local jurisdiction does not need to apply local or state congestion performance standards when evaluating proposed plan amendments against the TPR in OAR 660-012-0060. The act of designating an MMA is also not subject to significant effect evaluation requirements under this rule. Within an adopted MMA, these land use decisions need not be tested for “significant effect” for performance standards related to motor vehicle traffic congestion. MOTION (friendly amendment incorporated): Councilor Evans, seconded by Councilor, moved to suspend the council’s October 21, 2015, motion until after the council has had a work session to consider the outcome of a facilitated discussion that includes at a minimum the affected residents, Council of South Eugene Neighbors, and businesses and the City, utilizing the services of a neutral facilitator such as Oregon Solutions; except that the council shall not hold a public hearing on the South Willamette Special Area Zone until after the council confirms a public hearing date following the completion of the facilitated process. FAILED 5:4, Councilors Zelenka, Evans, Syrett, and Pryor opposed. Mayor Piercy broke the tie in opposition. The proposed plan reduces the number of lanes on Willamette Street from 4 to 3 to accommodate new dedicated bicycle lanes. Those voicing opposition cited dangers for all who use the street and the impact of reduced response time in emergencies. The Firefighters and LTD submitted written testimony into the public record for the April 14, 2014, City Council Meeting. Individuals present at the meeting, also presenting testimony, were Ronald Zauner, Margo Zauner, Ron Tyree, Jeff Davis, Linda Nelkin, David Nelkin (submitting the petition signatures), and Scott Landfield. “State law . . . requires municipalities to have a 20-year land supply for homes, businesses and industries.” (Edward Russo, “Envision Eugene growth strategy approved by City Council; Lane County approval needed next.” The Register-Guard, July 21, 2015. Just how many people are coming? How many new housing units are needed to accommodate them? Note that while the enumeration of neighborhoods in the new map (right) shows a total number at 26, the actual number of neighborhoods is 23, the same as in the previous map. Three numbers are missing in the new map: 6, 9, and 23. While the older map lists the neighborhoods alphabetically and assigns a number in that order, the enumeration of the new map does not follow any logical pattern. The name change to Southwest Hills Neighborhood Association seems to have occurred sometime in 2015. SHiNA’s charter was “Updated as of March 2015.” The new neighborhoods map (below, right; detail) is dated July 21, 2015. Along with the 2015 name change, the boundaries of the association also changed, taking in properties formerly part of Southeast Neighbors: south of and following the west side of Willamette Street, down to and up within the Urban Growth Boundary. This action reduced the size of Southeast Neighbors and enlarged SHiNA. CDCA had been previously enlarged in 1981 ("Crest Drive association plans meeting tonight"), when properties between 24th & 28th and between Chambers & City View were added. The annexation incorporated newly developed areas that had not been represented by a neighborhood association. Members of the Crest Drive Citizens Association prepared a “refinement plan” addressing land use in its zone in compliance with the City of Eugene’s 1990 Plan, but the plan was not accepted by the city’s staff. “The Envision Eugene Comprehensive Plan is one plan among a family of land use plans at the state, regional and local level. As a state-mandated land use plan, the comprehensive plan has a certain relationship to other adopted plans. The Envision Eugene Comprehensive Plan is the basic guiding policy document for land use planning within the urban growth boundary for the City of Eugene. The Eugene-Springfield Metropolitan Area General Plan (Metro Plan) is the basic guiding land use policy document for regional land use planning. Eugene’s refinement plans (including special area studies, area plans and functional plans) must be consistent with applicable provisions in both the Envision Eugene Comprehensive Plan and the Metro Plan. If inconsistencies occur between the Envision Eugene Comprehensive Plan and the Metro Plan, the Envision Eugene Comprehensive Plan is the prevailing policy document. To adopt Eugene’s new urban growth boundary, staff is preparing documents required under Oregon statewide planning rules and statutes. 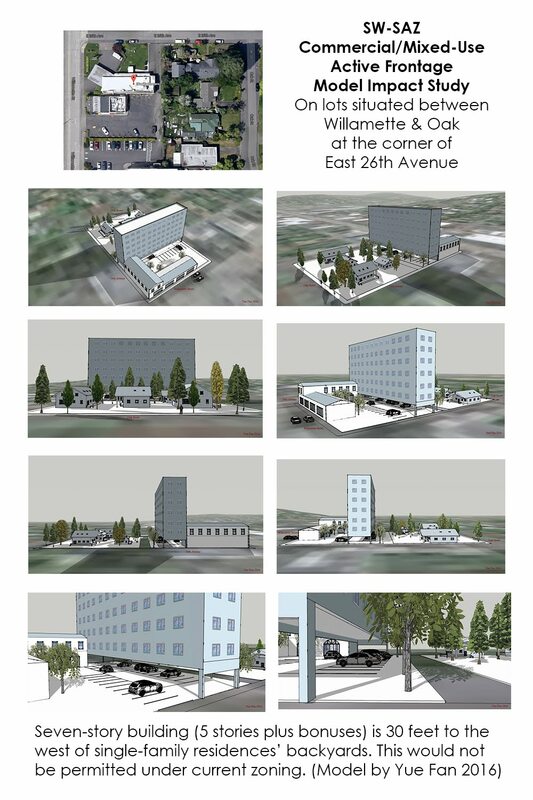 This set of documents is referred to as the “UGB adoption package” that will allow Eugene to set and maintain its own UGB, separately from Springfield. The Envision Eugene Comprehensive Plan is a major component of the UGB adoption package. In addition to this required piece, several other important documents will be reviewed and discussed on a similar timeline. These documents, including the Community Vision, the Urban Form Plan, and the Action Plan, carry forward the content and direction of the 2012 Envision Eugene Recommendation to help the community realize its 20-year vision. However, they are non-regulatory and are not required by state law. The complete set of documents, both regulatory and non-regulatory, is now called Envision Eugene: Vision to Action. 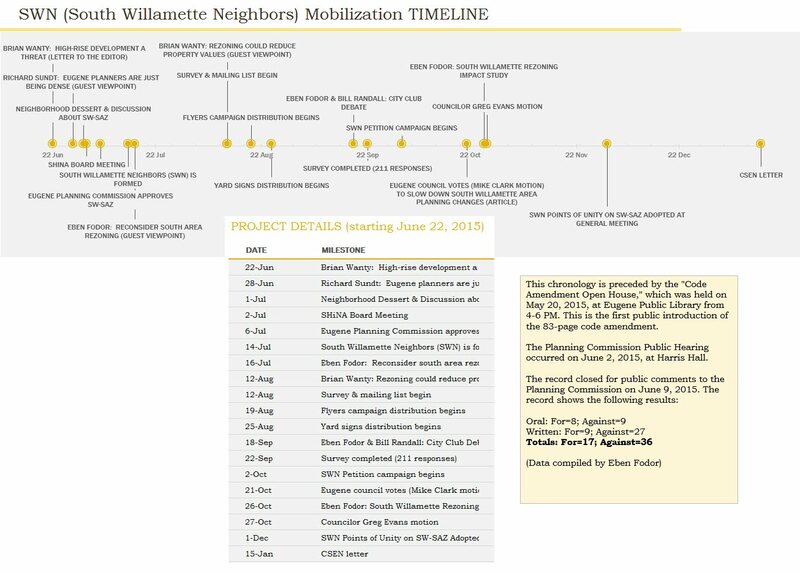 The graphic in Attachment A shows how the Envision Eugene pillars, 2012 Recommendation, and subsequent Council direction flow into the preliminary draft of Envision Eugene: Vision to Action. The graphic also lists what is included in each of the four parts. The City of Eugene's homepage for Envision Eugene is at http://or-eugene.civicplus.com/index.aspx?NID=2973. Please check this page for future updates.